CREDITS: Equivalent to 14 ECTS. Through this program, the student will get familiar with the principles of Esthetic Dentistry, and the importance of interdisciplinary approach in achieving optimal results, focusing on minimally invasive dentistry as a basic premise. Through an adequate esthetic (esthetic and dynamic) diagnosis of peribuccal, gingival and dental parameters, the student will be able to elaborate an interdisciplinary treatment, to plan and to solve all kinds of cases. A special stress will be put to diagnosis and treatment plan, aided by a smile design program. With a knowledge of laboratory procedures, a student will be able to understand different tests that should be carried out, and the importance of a correct communication between the laboratory technician and a clinician. During this course program, different materials and restoring techniques which form a part of the smile rejuvenation treatment and adhesive oral rehabilitation will be taught, i.e. : teeth whitening, veneers (composite or ceramic), direct reconstructions, different types of incrustations, metal-free restorations and management of gingival architecture and emergency profiles both in fixed prosthesis and implants. Pre-clinical and laboratory hands-on classes. During the Diploma program, all our students will assist the lectures and hands-on workshops given by professionals of national prestige, experts in dental esthetics problems. The reading of the bibliography provided by teaching staff is recommended, as well as the attendance of national meetings of related scientific societies. Diploma in Esthetic Dentistry, with lecturing hours equivalent to 14 ECTS. Principles of dental esthetics and adhesion. Indications de different materias, techniques and restoring and rehabilitation otions of minimally invasive Esthetic Dentistry. Ceramic lamination, step by step. Control of all commands and parameters of dental photography equipment. Instructions and guides for protocolizing of all types of photographic extra and intraoral records. Prediction technique for esthetic restoration of anterior teeth using composite. Restorations in Class III, IV, V, microdontic teeth, space closure. Stratification in posterior sector with composites to dominate the morphology and characterization of posterior teeth. Different alternatives to implants in anterior sector. Management and remodeling of periimplant tissues and fabrication of provisional teeth. Customized diagnosis of each case and a customized treatment plan according to the type and level of discoloration and characteristics of each patient. Restoring options in anterior deteriorated teeth basing on ACE classification. Different preparations of incrustation: inlay, overlay, onlay, and veneer-onlay. Step by step instructions of adhesive buccal restorations with the maximal care of remnant dental structure. FORMAT: Seven 2-days modules (16h), on Fridays and Saturdays from 9am to 2pm and from 3 pm to 6 pm. 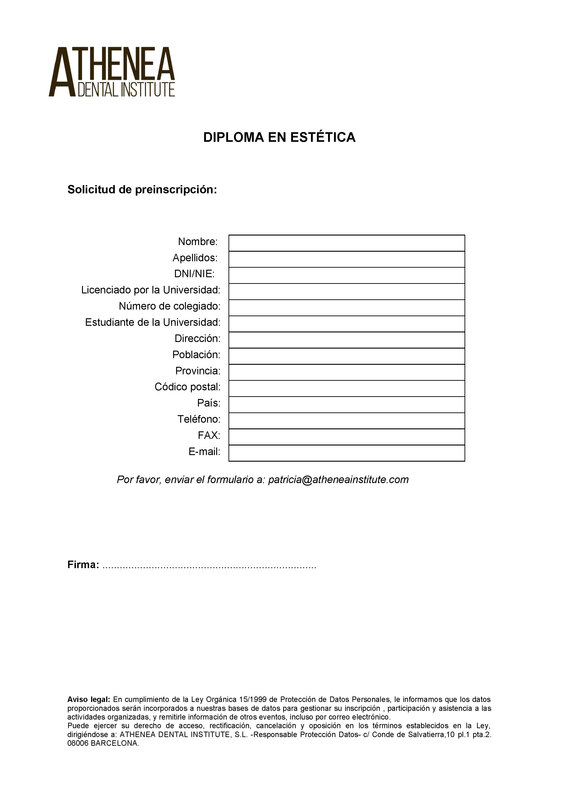 Notarized copy of a corresponding Graduation Diploma (Dentistry or Stomatology). In case of foreign diploma, it should be officially accredited by corresponding Spanish authorities. Academic certificate of obtained qualifications (original or notarized copy). One color ID-sized photograph in jpg format. Athenea Dental Institute and Diploma Program Director reserve the right to modify credits price. Furthermore, the time table and theory&hands-on program can be changed according to the needs of lecturers of this Program. Matriculation: 30% upon course booking after being admitted: 2.040 euros. The rest: 70% upon the signing of the contract (September): 4.760 euros. Only one module: 1.100 euros. The student should meet payment deadlines. Failing to meet the payment deadlines will be understood as renouncement of the participation in the Course Program. If a student doesn’t respect the established installments, his admission will be considered cancelled. If the cancellation takes place before the beginning of the academic course, the student will have the right to get the refund of 80% of what he paid as long as his vacancy can be replaced by the admission of other student.